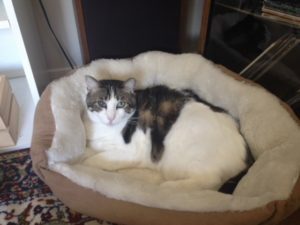 Resolving Jealousy In Cats Holistically | Purrrfectly Holistic Purrrfectly Holistic…a Boutique for Cats! For those of us who absolutely love cats it’s no surprise how easy they tug at our heartstrings. When you have one cat and decide to get another one it’s usually an easy decision…especially when it’s a really cute kitten! Whether you realize it or not there’s an unspoken hierarchy when you have multiple cats. Furthermore, because cats are very emotional creatures, eventually you may observe some jealousy issues. Jealous cats can act out in ways that are very upsetting for everyone in the house. Taking a holistic approach to resolving jealousy in cats is easier than you may realize. I ran into my friend, Manny, a couple of weeks ago, and we hadn’t seen each other in awhile. He’s a huge cat lover and has the biggest heart whenever he finds cats in need. When I asked him how his cats were doing a sadness came over him. One of his cats had been spraying in the house and on bedding, blankets, etc. for several months, and his wife had finally had enough. She had given him an ultimatum that he’d have to make a choice and find a new home for the cat causing all the trouble if he couldn’t make it stop. He was desperate and worried because he didn’t know what to do! Their cats were family, and having to make this kind of decision was heart-wrenching. It was not by accident we bumped into each other! We sat and talked for a while as he poured out his story. About a year ago one of the outdoor stray kitties he was feeding brought home her new kitten. She was an adorable ball of white fluff, and Manny was smitten. He finally convinced his wife to bring them both inside. Both Mama and baby Pixie had no problem adjusting to life indoors, and their resident male cat, Gary, adjusted without incident. Some time later another beautiful orange tabby showed up. 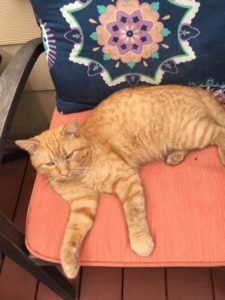 They named him Garfield, and eventually they brought him inside, too. He soon became friends with the other females, and Gary felt left out. Now the odd man out, he was upset. Right away Manny and his wife started noticing that someone was spraying around the house: walls, furniture, blankets…nothing seemed to be off limits to the offender. It became a real hassle cleaning everything up, not to mention frustrating. If you’ve ever had to clean up cat pee you know how pungent it is. Cats can still smell it after you’ve cleaned the area with special cleaners formulated especially for cat urine. Manny and his wife tried the enzyme cleaners and even the pheromone plug-ins (which are synthetic chemicals). Nothing worked. Taking a holistic approach to this problem was the only way to solve it and restore their happy cat household. First identify the cause: jealousy of the male, Garfield. Gary, was identified as the culprit, and because of his jealousy he was acting out and marking his territory. He felt left out because Garfield was now buddies with Mama and Pixie, and his feelings were hurt! By marking he was telling Garfield who was top cat. I consider his behavior a cry for attention and help. Manny needed to step back and look at things from Gary’s perspective. I made a few simple suggestions: give Gary a lot more attention, add playtime both alone and with the other cats, and use a flower essence remedy to help him heal emotionally. I even suggested he use the flower essence remedy on all the cats because it helps ease stress when adding a new addition (even though it was months before). 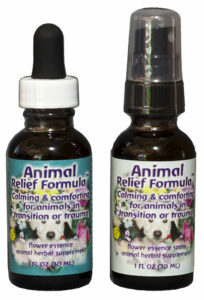 Animal Relief Formula is a custom blend of flower essences that helps animals heal on an emotional level when they’ve experienced any kind of trauma, abuse, bringing a new cat into the household, feelings of loss, and conflict among pets. It is my go-to product for any kind of spraying or litter box avoidance issues. Flower essences are dilute, potentized herbal infusions or decoctions, prepared from wildflowers or pristine garden blossoms. They are made directly in the “laboratory of nature,” where the four alchemical elements of earth, water, air and fire are found in harmonious balance. To this is added the fifth “quintessential” element of the sensitive awareness and atunement of the preparer. The fresh, dew-filled blossoms are gathered in the early morning of a clear, sunny day. Floating on the surface of a bowl of water, they are irradiated by the warmth and light of the sun for several hours. This process creates an energetic imprint of the etheric energy pattern of the flower in the water, embodying the healing archetype of that plant. They work through the various human (and animal) energy fields, which in turn influence mental, emotional and physical well-being. This can affect behavior as well as physical symptoms. Using the flower essence formula is simple. Put a few drops or sprays into your hands and rub them together; then pet the cat head to tail. Rub around the cat’s face and ears, too. 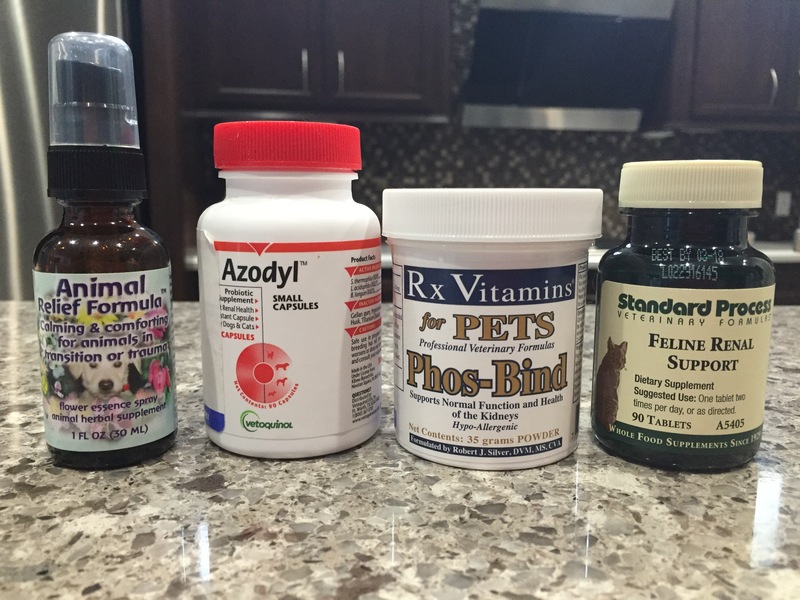 You can put four drops into food and water and on bedding or the cat’s favorite hangout spots. Do this four times a day for about a month. You should start to notice a change within a couple of weeks. Once the behavior stops you can stop applying the remedy. If it starts again just start applying the remedy again. Manny stopped by this past week to give me an update. It had been two weeks since he started doing the suggestions I gave him. He was smiling! “It’s working!” he said. I don’t think I’ve ever seen him more relieved and happy. He was blown away by the results, and it had only been two weeks. The spraying has stopped, and Gary seems calmer. This news made my day! 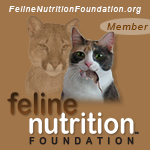 Whenever you encounter a problem with cat behavior it’s so important to search for and address the underlying cause. Then you can find specific ways to help the cat change his own behavior and restore emotional health and peace in the home. Have you ever dealt with a jealous cat? What did you do that worked? Share in the comments below! Thank you for sharing this story on your favorite social channels, and don’t forget to sign up here to follow our blog! You can read another blog about using flower essences here.